Plans for a 5km cycle route through Greater Manchester are being hailed as one of the UK’s most ambitious cycling and walking schemes as a British Olympian attempts to ensure drivers make way for cyclists and pedestrians. Chris Boardman, who won gold for Great Britain at the 1992 summer Olympics, is now the region’s cycling and walking commissioner, and is central to now putting greener, more sustainable methods at the heart of Greater Manchester’s future transport decisions. The latest proposals are integral to the cycling advisor’s 1,000-mile cycling infrastructure plan with the 5km cycle route to run from Manchester to Chorlton, giving cyclists and pedestrians priority over cars at key junctions along the route, if given the go ahead. Inspired by European cities like Amsterdam and led by Brian Deegan, the engineer behind London's Boris routes, the route will run along Barlow Moor Road, Manchester Road, Upper Chorlton Road and Chorlton Road. Cycle lanes will be a mixture of segregated paths and marked lanes and the their creation will involve major changes at various junctions to introduce priority crossings for both cyclists and walkers. Back in June, Boardman and Greater Manchester mayor Andy Burnham revealed plans to invest £150m in walking and cycling infrastructure for the region. This £13.4m route is just one of the 'Beelines' - interlinked bike and walking lanes – that was proposed earlier this year. The wider goal of the massive investment programme is to connect every community, making cycling and walking safe for ‘every 12-year-old’ and offer an alternative to driving for thousands of people across the city region. The Manchester to Chorlton cycling and walking route is being proposed by Manchester City Council, the One Trafford Partnership, Transport for Greater Manchester and Greater Manchester’s cycling and walking commissioner Chris Boardman. 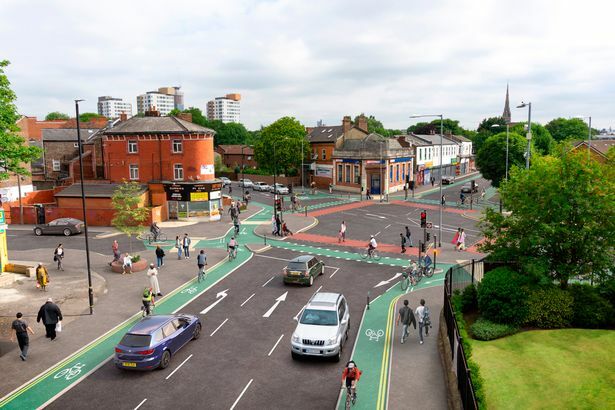 Manchester City Council's executive member for the environment, planning and transport, Angeliki Stogia, said: “We are excited to have Chris Boardman's input on creating world-class walking and cycling infrastructure in Manchester. Lots of people have said that they want to walk and cycle more in Manchester and we present this scheme for consultation, as part of our ambition and absolute determination to create a new network of high-quality, safe cycling routes across the city. The public consultation period on the designs will run until 11 January 2019.